The Russian jet crashed in Syria earlier on Tuesday with two people aboard. The plane was most likely downed by a ground missile, according to the Russian Defense Ministry. According to initial ministry information, both pilots were able to eject from the airplane. Their current condition and whereabouts have not been released. 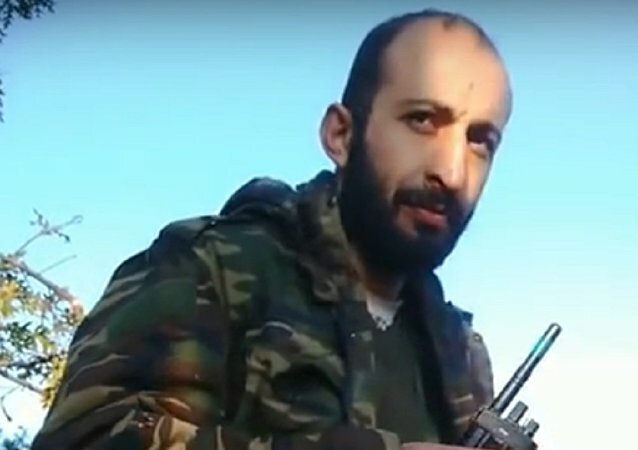 Alparslan Celik, the man who took responsibility for murdering one of the pilots of Russia's Su-24 jet downed by Turkey in Syria in 2015, has been sentenced to five years in prison for illegally possessing weapons. A monument to the late Lt.Col. 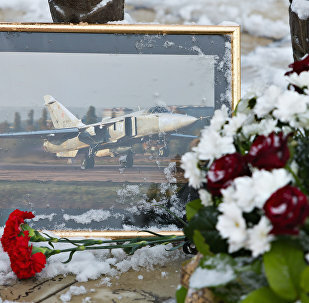 Oleg Peshkov, Russian combat pilot killed in action in Syria, was opened in the city of Lipetsk. The widow of the Russian Su-24 pilot, downed by the Turkish Air Force in Syria in November 2015, said she was ready to meet the Turkish foreign minister who had said he was ready to personally apologize to her. Outside forces may be responsible for the downing of a Russian jet over northern Syria by Turkish aircraft. Turkish opposition Islamic preacher Fethullah Gulen, suspected of guiding the recent military coup in Turkey, said that Turkey started rapprochement with Russia due to lack of other options. The compensation for the Russian plane Turkey downed in November was not discussed during the meeting of the presidents of two countries in an expanded format, Russian Economic Development Minister Alexei Ulyukayev said Tuesday. It is currently not the time to share information on the issue of any compensation to be provided by Turkey to Russia for the downing of the Russian Su-24 aircraft, Umit Yardim, Turkey’s Ambassador to Russia, said. The Turkish economy minister could not confirm that the pilots who shot down the Russian Su-24 over Syria also bombed the Turkish parliament during the coup attempt. According to Turkey's deputy prime minister, Ankara had devolved the right to decide on whether or not to shoot down planes to pilots before the incident with the Russian Su-24 bomber in November. Turkish Deputy Prime Minister Mehmet Simsek said on Tuesday a compensation for a Russian military plane downed by Turkey over Syria last year was not discussed at bilateral talks in Moscow. Some 79 percent of people in Russia believe that Ankara's apology for the downing a Russian Su-24 attack aircraft was offered too late, a poll conducted by the Russian Public Opinion Research Center (VTsIOM) and published on Monday found. The pilot of Turkish F-16 fighter jet that shot down a Russian Su-24 combat plane over Syria in November last year made the decision on his own, the deputy chair of Turkey’s ruling Justice and Development Party (AKP) told Sputnik on Thursday. The family of the deceased Russian Su-24 pilot Oleg Peshkov said they would not accept compensation from the Turkish authorities who offered to gift them a house in the Turkish resort of Kemer. The authorities of Turkey's city of Kemer want to open a park in memory of Russian pilot Oleg Peshkov, who was killed after his plane was downed by Ankara over Syria last year, the head of a Kemer-based Russian compatriots organization said Friday. 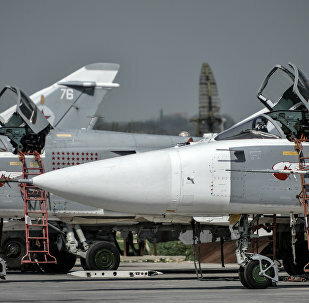 Russia expects Turkey to pay damages for downing of the Su-24 combat jet last fall in order to restore bilateral relations, Russian Ambassador to Ankara Andrey Karlov said Thursday. 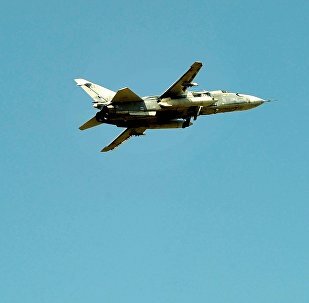 Russia will maintain contacts with Turkey on the subject of damages for the downing of the Russian Su-24 combat jet last fall, Russian presidential aide Yuri Ushakov said Thursday. The letter of Turkish President Recep Tayyip Erdogan to Russia expressing regret over the downing of a Russian combat plane by a Turkish fighter jet is a good initiative, Knut Fleckenstein, the vice-chair of the Group of the Progressive Alliance of Socialists and Democrats in the European Parliament, told Sputnik. 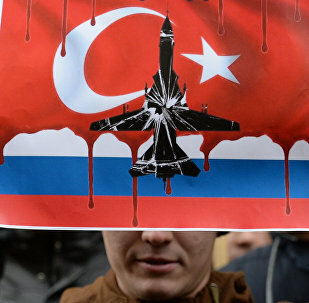 Turkey apologized to Russia for downing a Russian jet, however did not mention any financial compensation.